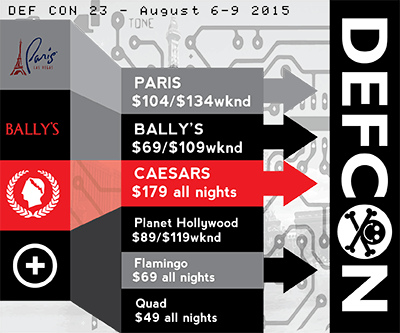 The DEF CON rate is available at the following hotels: Paris, Bally's, Ceasars Palace, Planet Hollywood, Flamingo and Quad. To get in on this rate, you'll need to use this link. Do not worry if the form doesn't immediately show the discounted rate. To verify that you're getting our price you can mouse over the dates you've selected or begin the checkout process. Click on the Map for a PDF Version!